Looking for an easy cute pillow for Christmas? 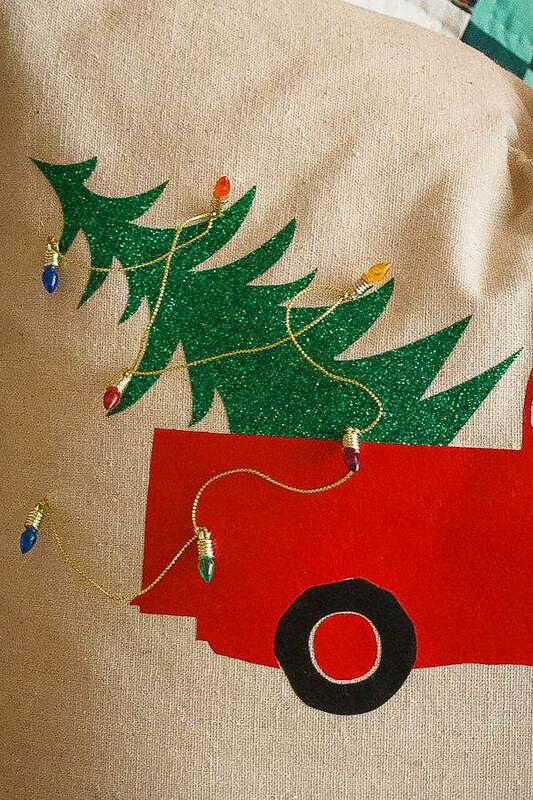 I love how this old-fashioned truck turned out with the glitter tree. Everyone is so busy right now. Rushing around buying gifts, making grocery lists and checking recipes, attending Christmas pageants and trying to have some family time this month. Who has time to “make” Christmas decorations? 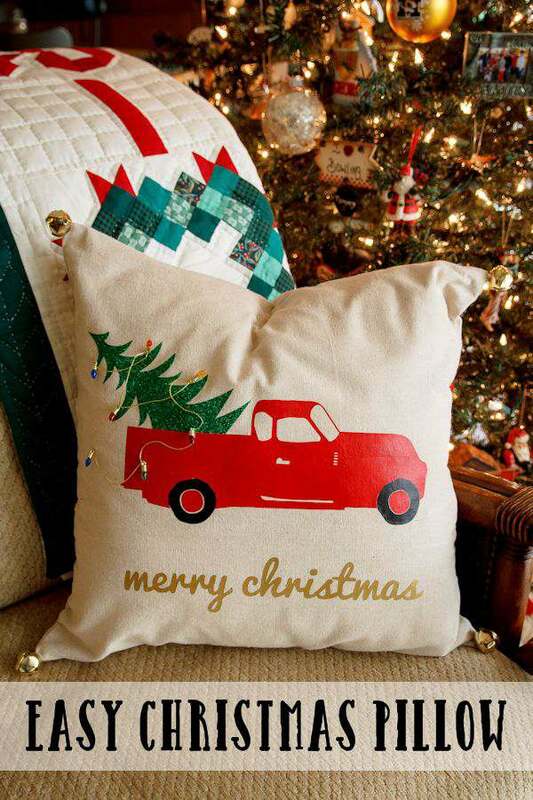 Well, I have an easy Christmas pillow you can make quickly. 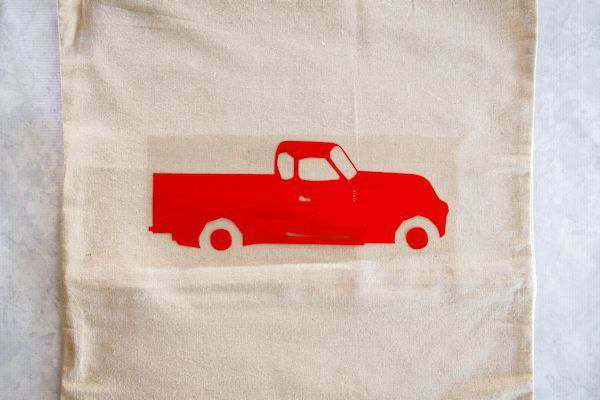 My husband loves trucks and we are both country folk, so I decided to make a quick pillow without having to drag out my sewing machine. I purchased the plain 18 x 18 pillow cover at Hobby Lobby and using their 40% off coupon made the price $2.99. There is a zipper in the back for changing out the covers. They have a ton of different types of pillow covers to choose from for all year round. The 18 x 18 pillow form and covers can also be found at Amazon, Walmart, JoAnns, Micheals and Hobby Lobby. I have been wanting to use HTV for a pillow for quite some time, but never got around to it. You know what I mean? I have used HTV before but for very small designs. Nothing big like this or with different colors. Any questions I have I grab The Ultimate Silhouette Guide book I downloaded from Silhouette School. Her instructions are very easy to learn and follow. 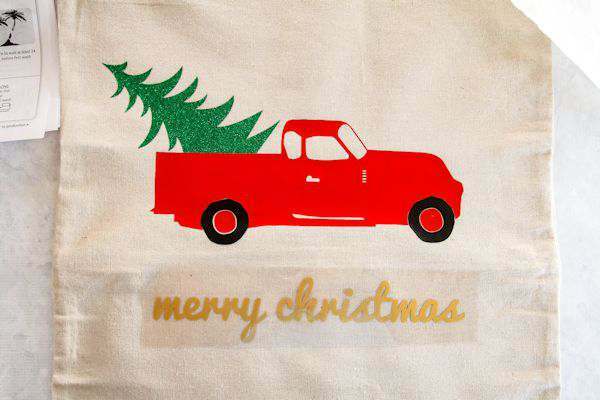 I used my Silhouette to design the truck with a Christmas tree and spell out Merry Christmas. 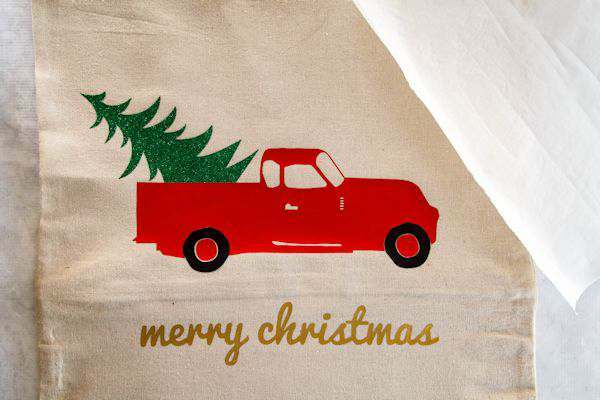 I actually put two different designs together of the truck and tree to make this design work. Iron the pillow cover and then place a thick towel inside of the pillow so when you iron down the vinyl the zipper won’t get in the way. Lay your design where you want it and lay a piece of parchment paper over that. Follow the directions which came with the HTV for iron settings and how long to iron the HTV. While your iron is on the parchment paper, press HARD for the number of seconds in the instructions. Don’t push your iron back and forth. Just press hard in one area, move to another area and press hard again until you have covered the whole design. 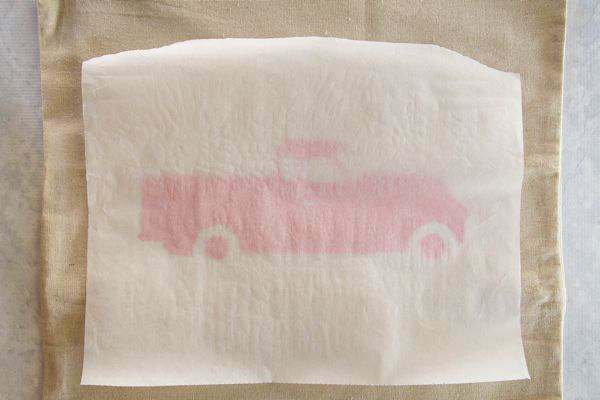 Let cool for a few seconds and slowly pull off the plastic and your design will be left on the pillow cover. If while pulling off the plastic cover and some of the vinyl hasn’t adhered to the pillow cover, just repeat the process again until the vinyl is secured to the pillow cover. The main reason for that happening is not pressing hard enough with your iron. Next lay the next piece to be ironed. I used glitter HTV for the tree and I love how it sparkles when the light hits it. 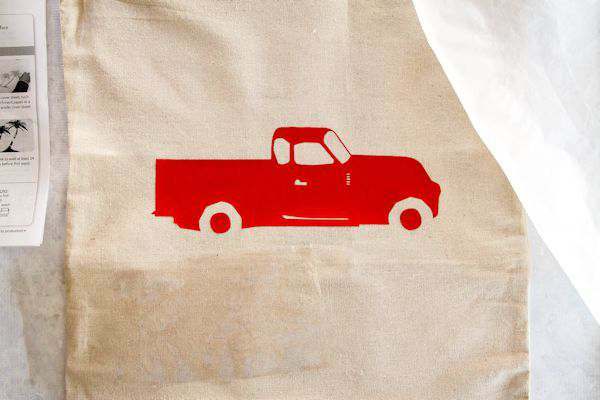 Repeat the transfer process for the rest of your design pieces. After the tree was put on, next came the tires. The last piece was the wording. Remember to flip your wording file before cutting it with your cutting machine or the words will be backward. All the ironing process is done! You can barely see the zipper area above the wording. The reason for putting a towel inside the pillow cover to help pad that area. I wanted to add small fake Christmas tree lights haphazardly to the design. I found these at Hobby Lobby also where the small village items are found. I just sewed them on with needle and thread and also added a large gold jingle bell at each pillow corner. See how the glitter HTV just sparkles and perfect to use for any Christmas decoration. I loved how it turned out and it filled a chair which didn’t have any Christmas cheer. Hubby really loved it. There are so many possibilities to make with pre-made pillow covers and your cutting machine. 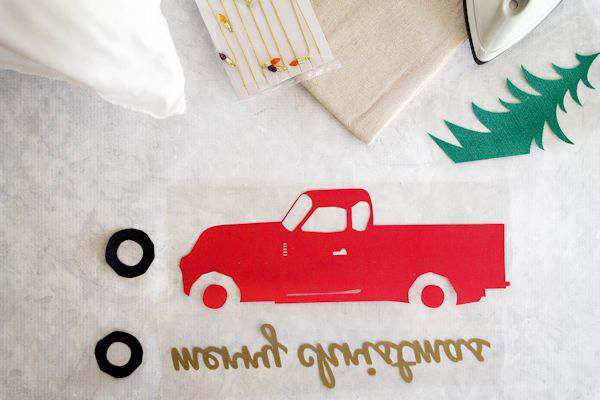 You could also make a stencil and paint something so cute for the holidays. I also made a golf cart version of this pillow for my mom. 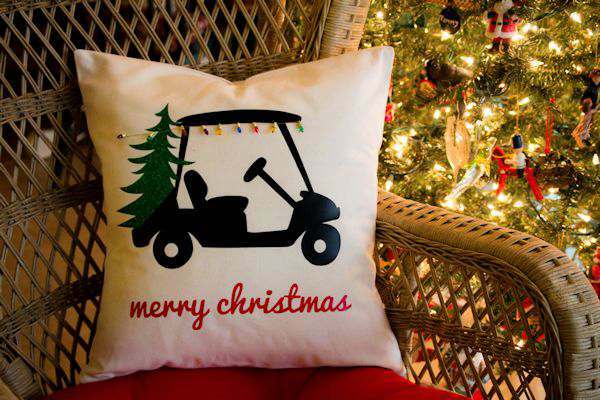 She lives in a golf cart community and this pillow design is perfect for her. The golf cart came from the Silhouette store. I used the same tree which came with the truck but just made a few adjustments to make it fit the golf cart. What an adorable pillow! I love that you can personalize it! Endless options! Wow – how creative! It turned out beautifully. This is a great gift idea too! That pillow is way cute and something I might be able to do. I love the little lights you added to it, it really makes the pillow. That’s so awesome. The pillow is adorable! And it’s easy to make, not complicated at all. That came out so cute! No wonder he loved it. You did such a great job, and I like how you strung those lights willy nilly like you did. What a creative project! 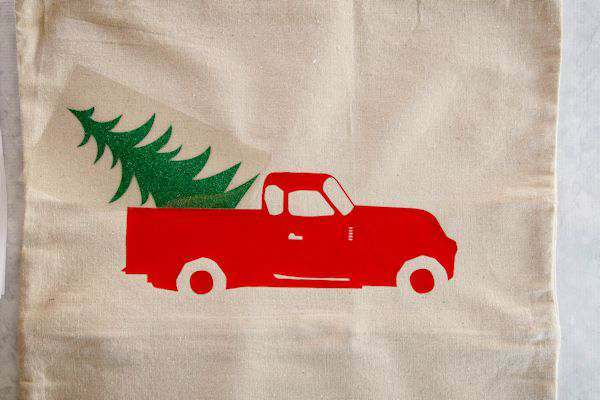 I love the use of the iron-on – I would absolutely use this in my Christmas decorating! This is sooo cute! It looks so simple and fun to make too! I love adding personal touches to my home : ) especially around the holidays! Wow this is very smart diys/crafts i love. 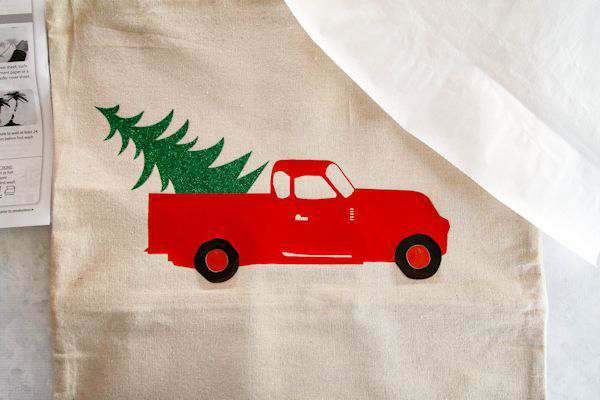 I’m gonna try it and make my own Christmas pillow. What a cute pillow. You are so creative. I love that this is so simple to make. That is simply adorable! I love the way you have the lights falling off the tree. This is really nice and easy to do, thank you so much for making this and shred. I really like it. Turned out cute as can be! I love the cute little lights on the pillow it really adds to the whole thing! How cute!